On Friday night Vanessa White followed in Alex James footsteps and was voted out of the competition in week 2. The Saturday’s singer was up against the Jimmy Osmond in the sing off but after a deadlock vote from the judges Vanessa failed to gain enough public support. Jimmy will hope for a better performance in week 3 as we all tune in to see who will be the next contestant to leave the competition. 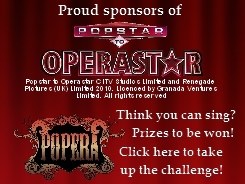 Don’t forget to try Opera yourself and be in with the chance of winning some fantastic prizes with Popera .